Trecco Bay in The Vale of Glamorgan is a fairly exposed beach break that has reasonably consistent surf and can work at any time of the year. The best wind direction is from the north northeast. Windswells and groundswells in equal measure and the optimum swell angle is from the southwest. Waves at the beach are both lefts and rights. Best around mid tide. 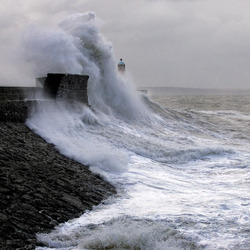 Voor Porthcawl, 2 km van Trecco Bay. At Scarweather WaveNet Site, 18 km from Trecco Bay. At Scarweather WaveNet Site, 11 miles from Trecco Bay. The two graphs above are also combined in the single Trecco Bay surf consistency graph. Also see Trecco Bay surf quality by season and Trecco Bay surf quality by month. 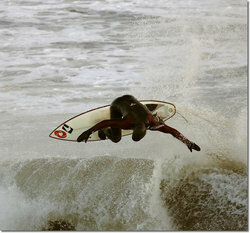 Compare Trecco Bay with another surf break. 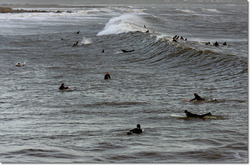 Gebruik deze reliëfkaart om naar de surfspots en de getijdenstations van Wales - South East toe te gaan, in de buurt van Trecco Bay. The closest passenger airport to Trecco Bay is Cardiff Airport (CWL) in Wales, 25 km (16 miles) away (directly). 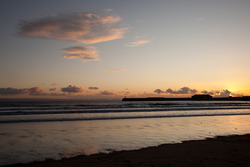 The second nearest airport to Trecco Bay is Swansea Airport (SWS), also in Wales, 30 km (19 miles) away. Third is Bristol Airport (BRS) in England, 68 km (42 miles) away. Bristol Filton Airport (FZO) in England is 76 km (47 miles) away. Exeter Airport (EXT), also in England is the fifth nearest airport to Trecco Bay and is 84 km (52 miles) away. 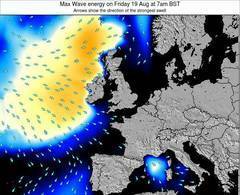 Dit is de Surf-Forecast-pagina voor Trecco Bay, Wales - South East. Gebruik de tabbladen hierboven om de zeewatertemperatuur bij Trecco Bay te bekijken, foto's van Trecco Bay, Trecco Bay gedetailleerde golfvoorspellingen, wind- en weersvoorspellingen, Trecco Bay webcams, actuele wind in Wales - South East live weerstations en Trecco Bay getijdenvoorspellingen. De link van United Kingdom golfkaarten opent een grote afbeelding van United Kingdom en de omliggende zeeën. Deze golfkaarten kunnen worden dynamisch gemaakt worden met de verschillende golfcomponenten, golfenergie, golfperiode, golfhoogte, samen met de wind en weersvoorspellingen, het actuele weer en de zeetoestand volgens golfboeien uit United Kingdom, langskomende schepen en weerstations op de kust. Elk voorspelling pagina's voor dit surfstrand zijn voorzien van een wereldwijde en regionale golfzoeker om de beste surfsomstandigheden in het gebied rond Trecco Bay te vinden.